CFC's Samuel Goni, right, heads the ball against Ocala's Paco Craig during Chattanooga FC's home-opener soccer match against the Stampede on Wednesday, May 13, 2015, at Finley Stadium in Chattanooga. It was the fitting finish for a solid performance by Greg Hartley. 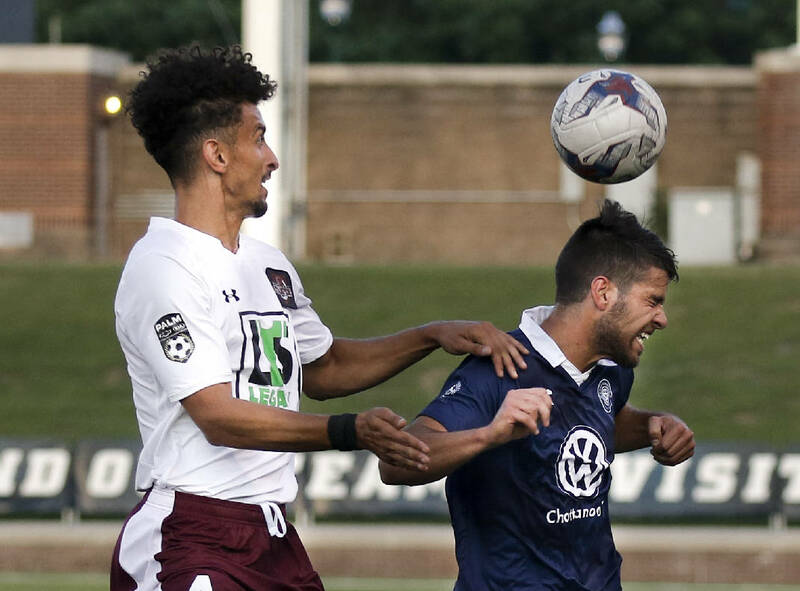 The Chattanooga Football Club goalkeeper had seven saves during the club's U.S. Open Cup match against Premier Developmental League team Ocala Stampede on Wednesday at Finley Stadium. He then added two saves when the match became a battle of kicks from the mark after 30 minutes of overtime, and he made the game-winning kick to send CFC to the next round with a 4-2 shootout victory. Luke Winter, Irvin Espinal, Jon Finlay and Hartley made their kicks in the shootout. The Stampede had conversions from Stephen Walmsley and Jose Ribas, but Hartley's blocks of attempts by Hilton and Ricardo Perez set up his game-clincher. "I normally wait until the last second," Hartley said of his reaction on penalty kicks. "It's about the placement of the hips; good players show their hips the other direction. I got lucky on the second one and was able to deflect the other one off the crossbar." Ocala's Paco Craig, right, collides with CFC goalkeeper Greg Hartley, left, and Jon Finley during Chattanooga FC's home-opener soccer match against the Stampede on Wednesday, May 13, 2015, at Finley Stadium in Chattanooga. A season after CFC (2-0) became the first National Premier Soccer League team to win a match in the nation's longest-running tournament, the club has the chance to do it again. CFC faces the team it beat in its first win -- the Wilmington Hammerheads -- in its next tournament match on May 27 in Wilmington, N.C.
"The crowd got their money's worth tonight," CFC coach Bill Elliott said. "It was an exciting match, but I thought the crowd pushed us on and gave us the edge to come back when we got down. "As far as Wilmington, I'm quite sure we're not going to sneak up on them like we did last year. We had the match last year at home on Finley, and we knew who they were and they really didn't know about us. We're going to be in for a fight to say the least." But before that, the club has a match against the Atlanta Silverbacks Reserves at 1 p.m. Saturday in Atlanta. CFC also has a match at home against the New Orleans Jesters on May 23. After a scoreless first half, the Stampede struck first in the second half when Lewis Hilton sent a low shot past Hartley. They held that lead until the final minutes of regulation, when CFC veterans Winter and Chris Ochieng combined for a goal. Ochieng flipped a header on a cross to Winter, who touched the ball in the net for the equalizer. "They're a good side," Hartley said of Ocala. "After coming in at halftime, we knew what we needed to do, and in the last 30 minutes and OT, we took it to them. I'm glad we won; we showed a lot of heart and passion."